I do not use the word “awestruck” lightly. In fact, if I was to rely on the most common definition which references having mixed emotions of both wonder and fear, it would be difficult for me to even think of other times in my life when that word would be applicable. All of that changed though when a dear friend of mine (thank you Ginny!) recently introduced me to the online world of Michael Grab, a self-professed Rock Balancer. Instead of me trying to adequately describe just what it is that Michael does and how it is that he left me so awestruck, I implore you to PLEASE take three minutes and fifty-five seconds out of your busy life to watch firsthand the video below of his “work.” Fair warning though (especially for Type A personalities) – be patient and do NOT take your eyes off what he’s doing. I can honestly say that, the first time I watched this, I not only “saw” the second everything came together, but I literally “felt” it deep within. I was NOT expecting either. In a nanosecond, my shrunken heart that had been fearing a collapse almost burst from the soul-expanding wonder of witnessing something that seems to defy all possibility of existing. Enter…..awestruck. Right about now, you’re probably sitting there – like I initially was – debating whether or not some “rock balancing guy” is worth an investment of the precious time that it will take you to view the video and/or to finish reading this blog post about him. Let me provide you with a little more insight about Michael before you make that critical decision. One of his core beliefs about what he does is, “it’s all about presence in the moment. SLOW down. Become the balance.” If you do watch the video (or perhaps you already did – hooray for you! ), you almost get a sense of time frozen, perhaps due to Michael’s intense – almost meditative – patience with the process. Patience that had me both breathless and squirming in my seat. And that – THAT – is why I felt I had to share Michael and his work/art with the world, in whatever way I could. Not because he and I both have a love affair with the artist nature of stones, but because of his unyielding belief that art is possible in even the most unlikeliest of forms. This is a guy who literally immerses himself in his work. He also not only realizes – but accepts – the fleeting nature of all that we create. As a writer, I personally can learn a lot from a young man like that. When he talks about “find[ing] a zero point or silence within [him]self,” I imagine how that translates into my own need to sit patiently at my desk while I find my own starting/balance point to begin constructing the (hopefully) rock-solid foundation of my next piece. When he discusses how “…rocks collaborate into an extremely complex system of balance. One piece slightly adjusted by fractions of a millimeter will yield collapse…,” I realize how every word I write ties into the next one and how my editing has the power to build the piece stronger, as well as to cause its destruction. “Slow down. Become the balance.” There really is no other way, is there? I hope that you or someone you know – someone who is perhaps struggling with believing in the possibility of their own art and/or in finding the balance of that art within the context of the rest of their life – finds some inspiration in the magic that Michael creates. For additional motivation, be sure to check out his website, especially his portfolio that depicts some of his amazing “towers.” As for his “bridges” and “spheres” – oh my! You just have to see them for yourself. The good news is, you can also buy prints of his work. One final note…..if you’re interested and if you can spare nine more minutes and fifteen seconds, I would highly recommend that you watch this other video. As the camera used for filming it is suspended directly from Michael’s head, it will let you experience the amazing process directly from his point of view. 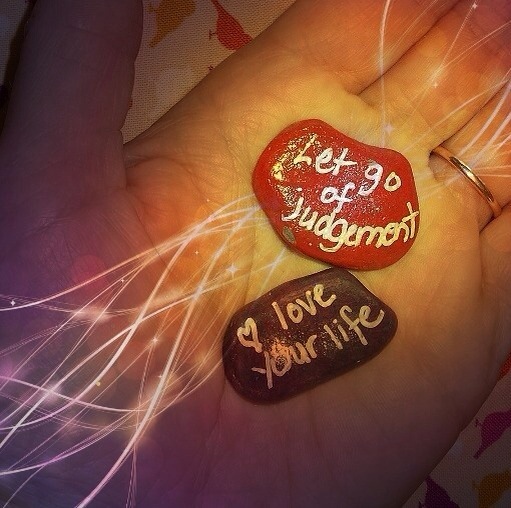 Art from yet another glorious angle…..
My small stones for yesterday and today…. 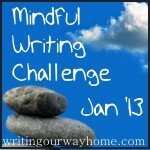 That was the “small stone” I submitted yesterday for the first day of the month-long Mindful Writing Challenge 2013. Small stones? Writing? Oh yeah – THAT’S the type of challenge I want to be a part of! And no – it’s not too late for you to also be a part of it. Described as “a simple observational writing tool…you don’t have to be a writer to write [small stones] – you just need to find a few minutes a day to pause and really pay attention to something (anything) and then write it down as accurately as you can. [It’s] a very simple way of engaging with the world around you, in all its richness and complexity and beauty…[It] will help you to acknowledge the ugly things (the slugs in the compost pile) as well as the pretty ones (a blackbird’s twirling song).” My apologies to slug lovers – I’m just quoting here. Previously known as the River of Stones, you can learn more about the Mindful Writing Challenge and writing small stones by visiting the Writing Our Way Home website. For more insight and inspiration, treat yourself to reading How To Write Your Way Home, a free 64-page e-book. Once you’re feeling a little more grounded about the concept of writing small stones, be brave (heck – fake it if need be) and create one of your own. Make some ripples in the writing world by then casting it out onto the Writing Our Way Home blog, your own blog/website, Facebook, or twitter (using #smallstone). As a lover and collector of stones, I’d be overjoyed if you’d like to share your small stones here with me. Simply add them as a comment to any of my posts. Together we can craft a meandering stone wall of words. If you’d prefer to keep your small stones close to your heart and in a special place for your own private viewing, perhaps you can carry a small pocket-sized notebook or a solitary index card to serve as a canvas to carve out your miniature masterpieces. By the end of the month, you’ll literally have a stone bouquet that will never wither or need watering. Whatever you do, have fun searching for your daily small stone. Simply sit still, breathe, and begin to notice what comes into your line of focus. A sight. A sound. A smell. A sensation. Preserve it in ink, whisper it to the wind, and then savor the echo of the small touchstone you’ve just created.